Although building quality aluminium trailers and boats is our main game, we definitely do not limit ourselves to just this type of work. GFAB also has a great reputation for fabricating one off general alloy engineering requirements. Aluminium fire guards, commercial shop stands and racking, bunds, water tanks, fences and balustrades to name a few. Your piece can be provided to you in raw alloy or powder coated by our neighbors BPC, who we work closely with on a day to day basis. 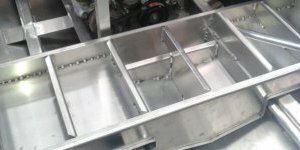 Contact us now if you have an alloy fabrication project and see what we can do for you. All our custom tanks are built with the purpose of gaining maximum capacity for the available space. Whether its a tank for a motor home, a live fish tank, fuel tank for a tricky spot or even a water tank, we will be able to help you! 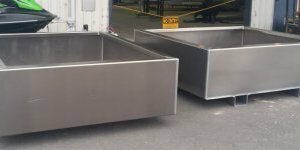 With the recent clamp downs on environmental, health & safety laws in NZ, these bunds are an ideal way of helping to keep your liquid hazardous substances in check & complying with environmental regulations.